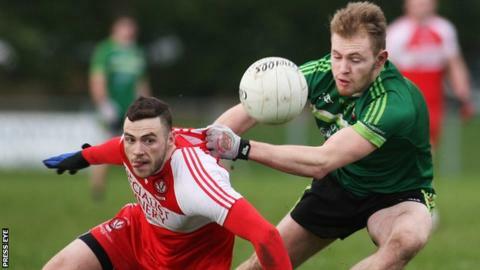 Derry's Dr McKenna Cup game against Queen's on Wednesday night (20:00 GMT) has been switched to Celtic Park as original venue Owenbeg is waterlogged. The Section A game is one of six matches which will decide Sunday's semi-finals line-up in the competition. Tyrone will secure a last-four berth if they avoid defeat against Antrim. Section B leaders Fermanagh will face a Donegal side shocked by St Mary's on Sunday with already-out Down taking on the Ranch outfit at Newry. Cavan will be guaranteed a semi-final spot if they hand a third straight Section C defeat to Monaghan with Armagh meeting Ulster University in the same group at the Athletic Grounds. As it stands, Derry are the best second-placed team in the three groups after their high-scoring defeat by Tyrone and a victory of any margin against the students in Derry city may be enough to secure a semi-final berth. Emmett McGuckin will be available despite his sending off against the Red Hands as his controversial dismissal was for two yellow cards. However, there is no guarantee that McGuckin will be involved as manager Damian Barton has said that he plans to make a number of changes for Wednesday's game. Mattie Donnelly is named in the Tyrone team after his 25th-minute introduction helped Tyrone fight back from nine points down to beat the Oak Leafers while Cathal McCarron will also make his first start of 2016. The side show nine changes from the Derry game with Niall Morgan, Hugh Pat McGeary, Barry Tierney, Harry Og Conlon, Cathal McShane, Lee Brennan and Ronan O'Neill all returning. Donegal will head into their game with Fermanagh boosted by the news that Rory Kavanagh has returned to the squad after opting out following the 2014 All-Ireland Final defeat by Kerry. Gallagher's side will need a big win over Fermanagh to move ahead of the Ernemen on scoring average but St Mary's can also still top Section B after their surprise victory in Letterkenny on Sunday. Ryan Johnston's late goal ensured the Ranch win over Donegal after the home side had squandered a host of scoring chance. Johnston is likely to be one of several Down panellists who will line out against the Mourne County at Newry with his brother Jerome, Kevin McKernan and Niall McPartland also part of the St Mary's squad. Down were decidedly second best in their 0-14 to 0-8 defeat by Fermanagh at Newry on Sunday when Sean Quigley hit seven of the Erne points - including three from play. St Mary's will fancy their chances of achieving another scalp against an under-strength Down line-up, who cannot reach the last four. Cavan are the only team with a maximum four points in Section C but while Monaghan's semi-final hopes are already over, it will be a surprise if the Farney men don't summon up a big effort at Breffni Park. Monaghan somehow contrived to lose against Armagh on Sunday despite controlling much of the game. However, Cavan's healthy scoring average of 1.850 at the moment means that even defeat may not be enough to deny them top spot in Section C.
Both the Armagh (0.931) and Ulster University (0.885) scoring averages are comparatively paltry at the moment so they may need to achieve a comprehensive win at the Athletic Grounds to maintain their hopes of topping Section C.
Brendan Donaghy could return for an injury-hit Orchard squad at the moment after being unavailable for the Monaghan game following his red card in the opener against Cavan. Tyrone: N Morgan; A McCrory, C McCarron, HP McGeary; B Tierney, Justin McMahon, P Harte; H Og Conlan, C Clarke; M Donnelly, M Bradley, C McShane; L Brennan, P McNulty, R O'Neill.